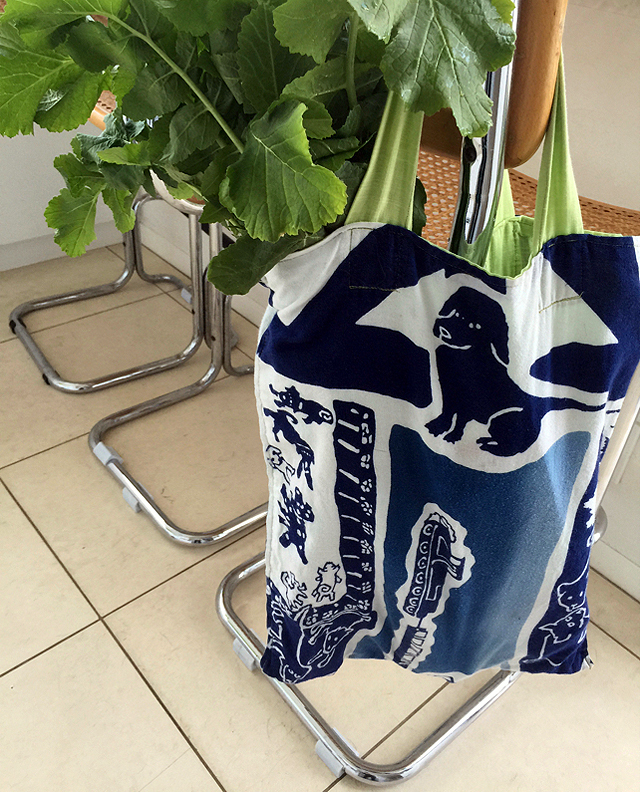 A long leafy white radish – in a charming Eco bag hand sewn by resourceful daughter Saya from a Sumida River dog scene tenugui, is a quirky presence in the kitchen. Blue & White has a way of making itself heard without raising its voice. As common as a road sign, a garbage truck, or a policeman’s uniform, as ever present as clouds in the sky, stars too for that matter, waves on the sea, birds on a river, blue and white is always there. It may be the national banner of Japan, the traffic light (it makes people stop, look, and listen), the national colors. Blue and white is soothing, reassuring, safe, and crystal clear. In Japan it is everywhere. I took photos of a typical day yesterday. Have a look at how blue and white it was. Every day is blue and white for me. But then of course, my eyes, and camera have filters. Be it the clothes I put on in the morning, the ceramics that serve me breakfast, the napkins that wipe my face, the sofa I sit on, the hangings on the wall, blue and white colors my days. My first cup of morning tea in a chunky blue and white mug by Ai Kobo, a resourceful residential craft center working with cloth and earth and canvas to encourage people with disabilities to express themselves with their hands and win financial independence. Dreamy scene to drink tea by and think of the day’s adventures, projects, plans. 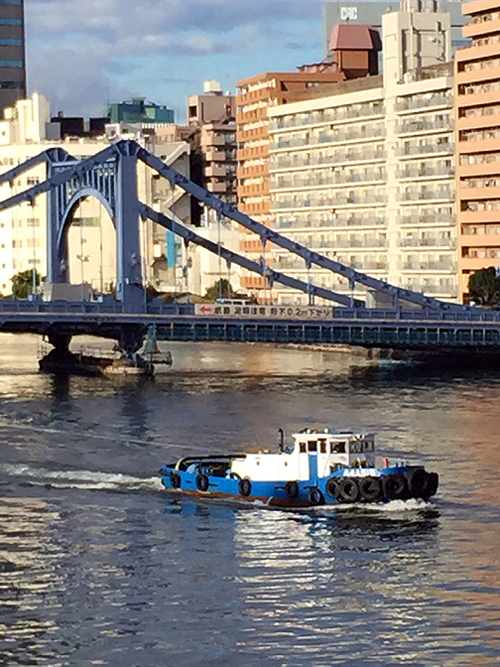 While tug boats chug by under the graceful Kiyosubashi (bridge) over the Sumida River. 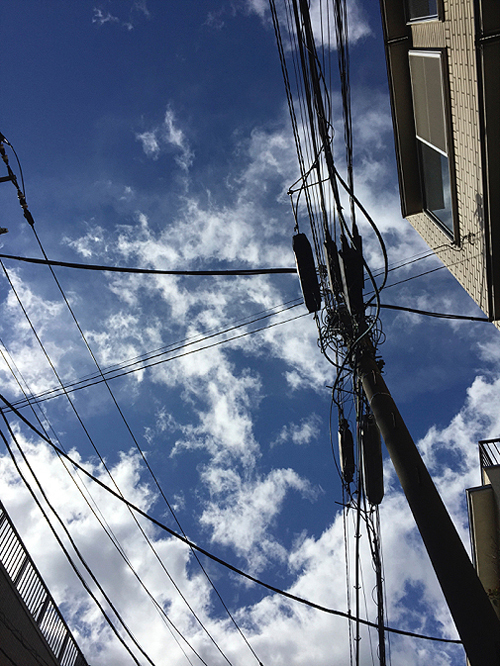 On a dog walk under blue and white skies and the chaotic network of telephone lines and electric wires. Food and drink along the way. Drink of the day in an attention grabbing blue and white vending machine. 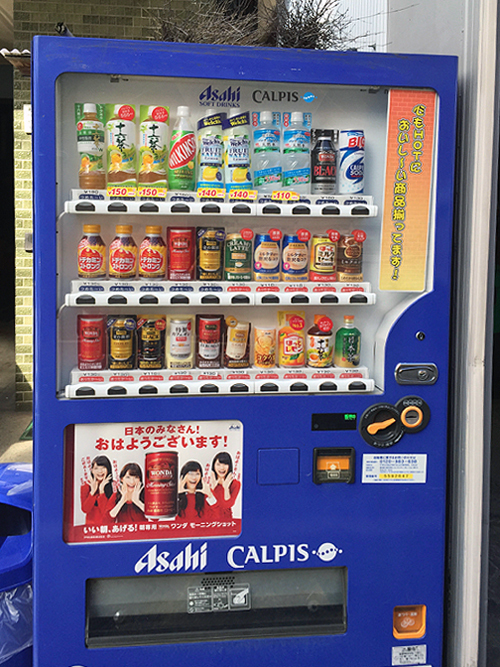 Try the Calpis! Fermented milk divine? 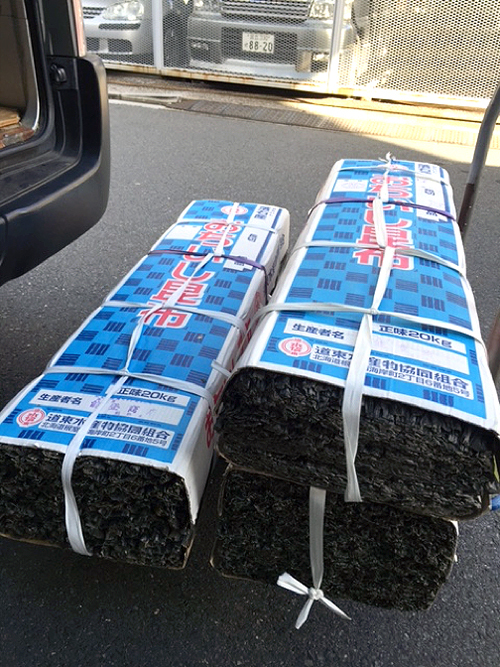 And sheets of dried konbu, seaweed, packaged in irresistible blue and white with a red kicker, are being unloaded from a van for storage in a nearby warehouse. The blues and the whites have it! 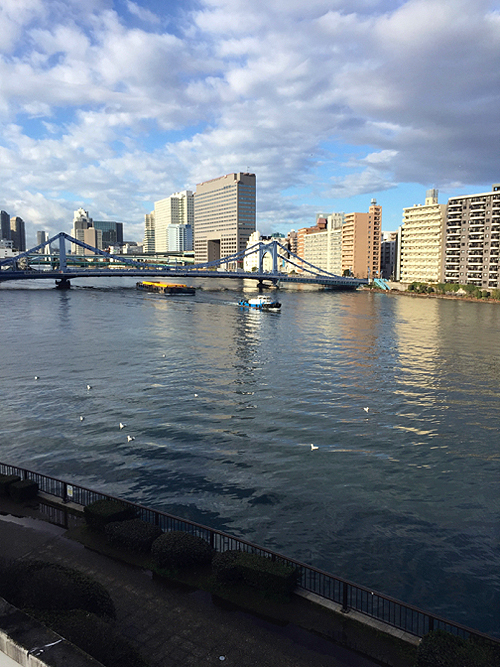 Blue & white bridges over the ONagi river (canal). 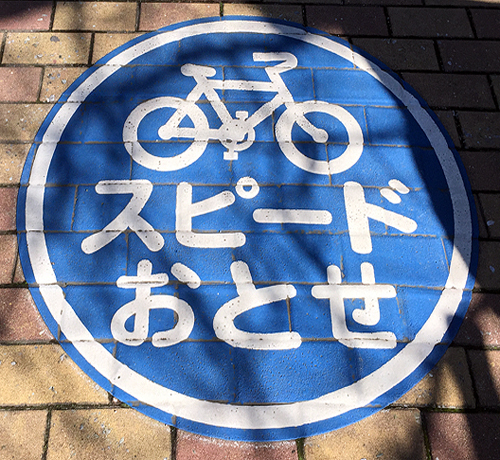 And bicycle speed rules on the sidewalk. Windows filled with flowers and cups and bags and other enticements, invite passersby to press their noses to the window and be inspired, recharged by blue & white energy. 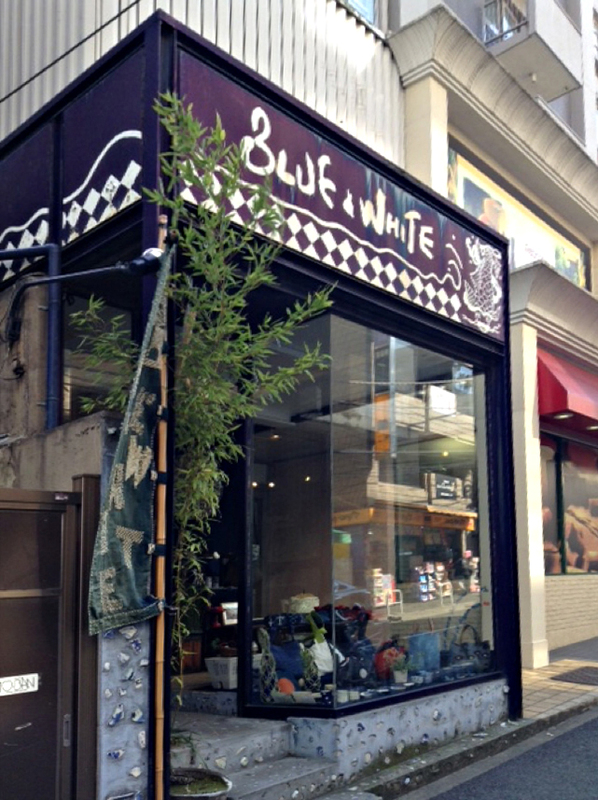 Welcome them to come in and browse through the blue and white treasures within. All handmade. All originals. All ready to help out and add spark to every day life. 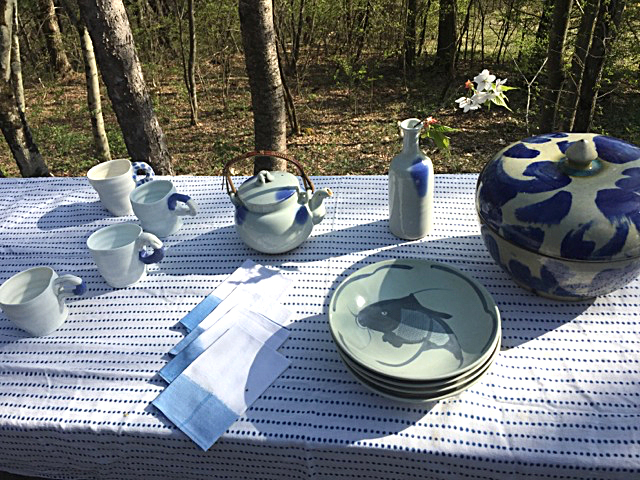 Tables are the center of life and sitting around a table covered in blue and white nourishes and stimulates. Rabbits and waves splash on the table and create bubbles an and swirls of energy, just waiting for leafy salads and other colorful grilled vegetables to perhaps to complete the feast. Anything Goes on the Table. Twin pentagonal sake cups are edgy containers for sake or soup or whatever needs to be served in style.With it a spotted napkin in gauze, and a Mottainai plate, rescued and revived with repairs in silver. Blue & White Rescue Society. 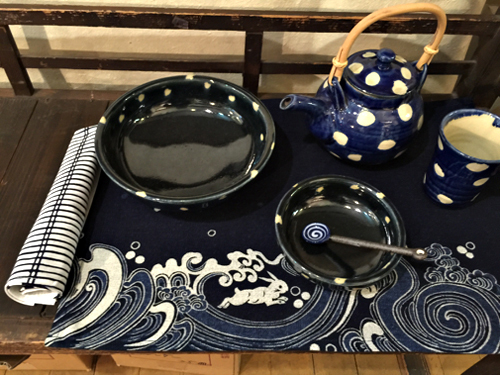 On an Aimomen, indigo look alike place mat ¥1620 in a variety of patterns a family of repaired blue and white dishes show you care enough to repair them and are proud to serve them and mix their patterns and shapes and ages. 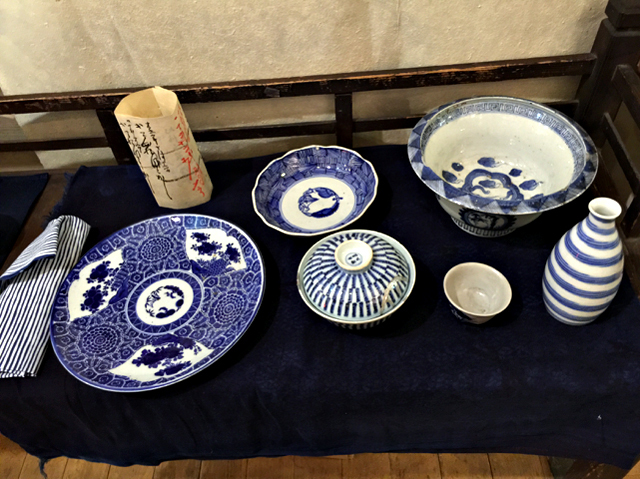 No such thing as matching sets of china in Japan! All one of a kind, so subject to being sold. A special kind of blue and white. Ai Kobo in Tokyo’s Setagaya, has a certain way with clay. 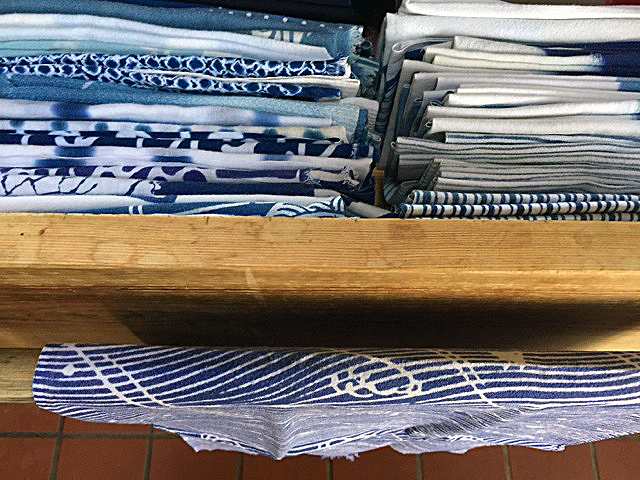 Mainly working in indigo dyeing, this very Special Abilities workshop keeps coming up with new shapes and designs that make a fresh statement of hand made, from the heart, on the table. Tea in a rough cobalt T cup by Ai Kobo. 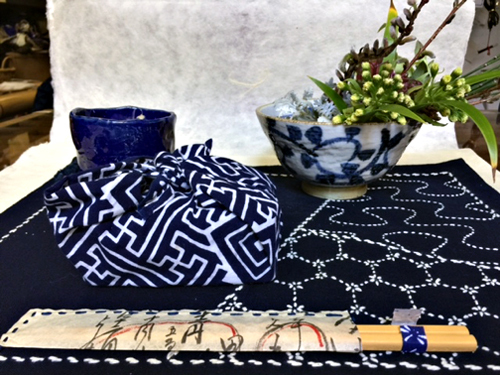 Nandina chopsticks in a handstitched washi cover. Tea to choose from one of the washi covered tea cans will stimulate fresh ideas to write on the Otafuku note pad with fresh tea flowers as inspiration. 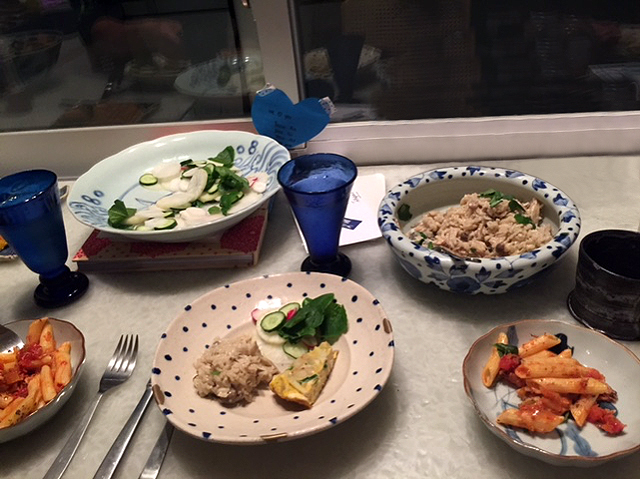 Beautiful dinner created by ever resourceful, ever thoughtful Akiko Morimoto, our newest and youngest staff member who is bilingual and artistic and fun. AND she’s a great cook! 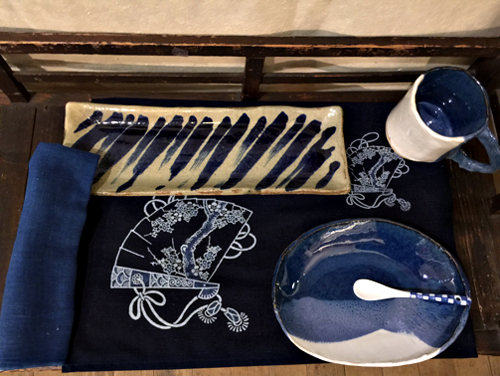 With fresh vegetables from her clothing designer Mum in Kanazawa, Takako Nishikawa, she prepared a delicious dinner, made even more appetizing by its presentation on a whole host of blue and white dishes. Of course there is no other color in the cupboard. Mismatching, spontaneous. free spirited, blue and white encourages freedom to be original in cooking and menu planning and their presentation. Be it penne with fresh tuna fish, or daikon salad, or japanese mushrooms in cream, blue and white sparks innovation and kindles good taste. 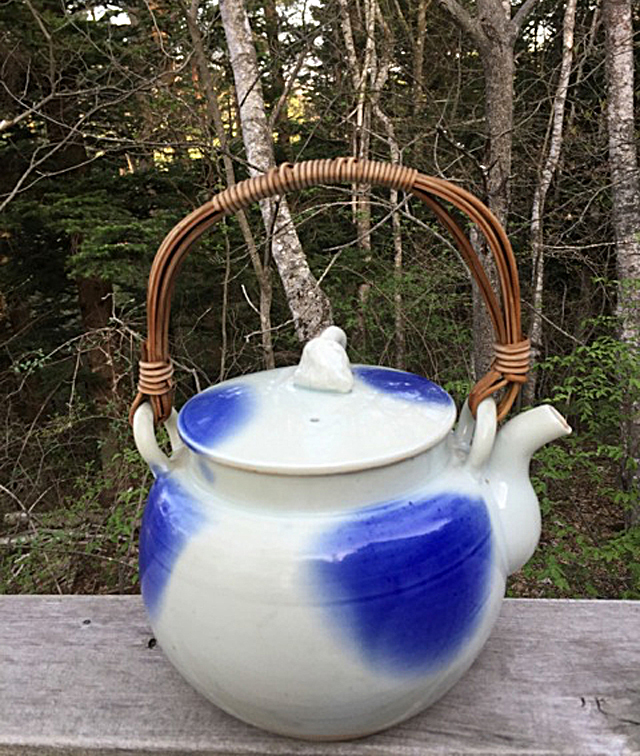 Antique spotted teapot from Seto takes the pride of place on the deck at breakfast time. 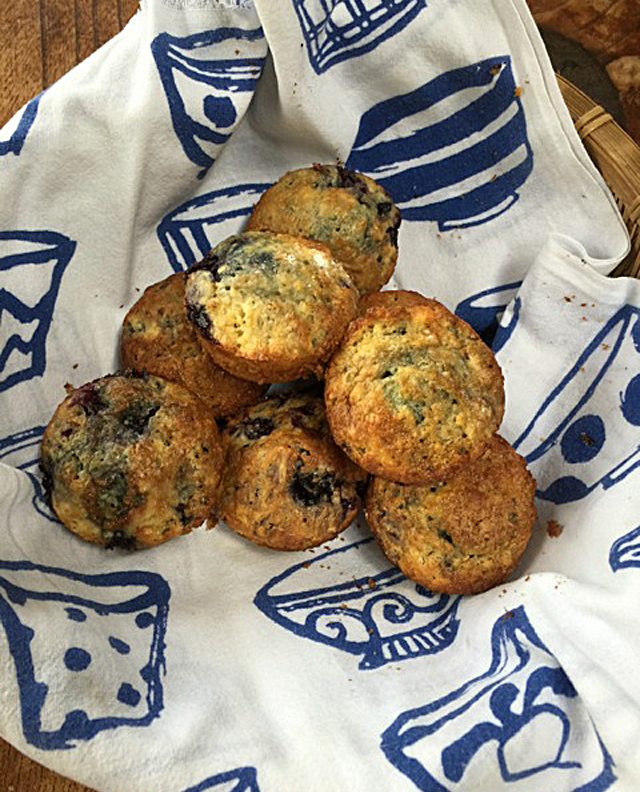 Served with blueberry muffins, a delicious blue and white breakfast food, yoghurt perhaps, with a topping of blueberry jam on a blue and white cloth makes for a breezy homemade brunch on an every day Sunday. 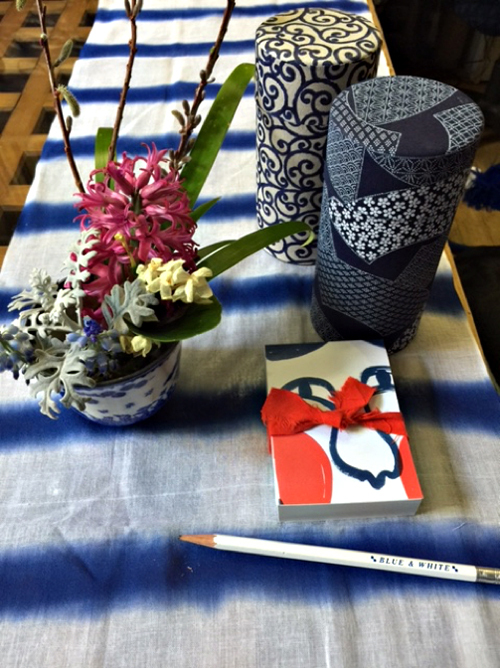 Blue & White takes everyday out of the ordinary and into the devine. And a drawer full of blue and white teenage towels makes even the clean up fun. I have that cloth with the blue-and-white cups and ochawan hanging in my kitchen — a wedding gift from my cousin. I love Blue and White!! Long may you prosper!! It will be 40 years in December. Every single photograph is a gem. I’ve never seen such intense blue skies! The teapot in the woods may be my favorite but it’s difficult to choose. I’m a little perplexed by the drawer full of “teenage” towels. They don’t look their age. 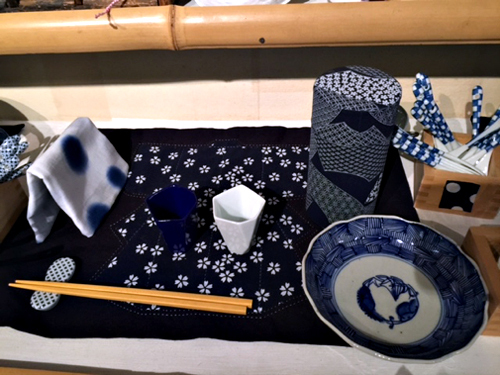 Correction: that should be Tenugui or dyed hand towels for work, for cleaning and wiping the dish towels, or hands. Some of them are teenagers and then some! More power to Blue and White and Amy. I still have one of your blue and white cloth covered bamboo baskets circa 1982, still as fresh as when I got it – in my guest bathroom. You go WAY back, don’t you my love! You and the book both! A very interestng post about a way of living in Japan. I adore blue and white colour and the way you present it makes it even much more interesting. For us europeans such information is priceless. Congratulations to Ai Kobo for their marvelous work and thank you for presenting it. Please do continue with such posts. Eagerly awaiting the next one. Best regards, Zora Poznic Polh, Slovenia. To think we have reached you in Slovenia thrills me! as is our love of beauty and peace that we share. I will tell the artists at Ai Kobo that you wrote. They will be delighted! and amazed ! I go back to Japan with each. New posting. Thank you! I love seeing through your blue and white eyes. What a beautiful line – The ordinary becomes extraordinary! May I use it in future writing ? S’wonderful, s’marvelous as always – inspiring and wonderful. Those bright, clear blue skies are so different than they were in the 70’s. Missing you and hope to see you before too many moons. and are always close by. I love blue and white! Perhaps it is my Danish heritage or perhaps it is the 3 years spent living in Yamanashi prefecture 1975 to 1978 as a young adult. Japan changed me for life. I only buy blue or blue and white things or clothes these days. Wish I lived close enough to visit your store. Next best thing is reading your posting and seeing your photographs. I also have a lot of blue and white things from when i lived in China (Chongqing and in Kunming) 1981-1983. The blue and white fabric was so wonderful…and to see the dyers making the indigo in huge vats and then dying the cloth was fabulous…in places at that time not yet open to tourists… It was another life. Hi Amy…I love this newsletter, as I look forward to and love them all. Thanks for the time you take to compose them. Now I only want Blue and White in my cupboards like you!! Lots of dishes are on their way to a charity shop. Haha. It is comments like yours that makes it all worthwhile. That and the fact that there is so much beauty in the blue and white of Japan that I want to share.